❥ PRECISE HEART RATE MONITORING. 24-hour real time heart rate monitoring protects your health. Do exercises with specific heart rate monitor and it will record and analyze your heart condition data in the APP. It's a really good healthy helper, but can't be used as a professional medical heart rate monitor chip. ❥ MULTI-SPORT MODES NEW FEATURE. Tracking specific exercises like trekking, fitness, spinning, treadmill, yoga, basketball, football, dancing, etc, 10 sport modes with detailed data of heart rate and calories burned, also, you can check the data and see today's ranking in the APP with your friends . ❥ MULTI-FUNCTIONS LET YOUR LIFE BE MORE CONVENIENT. 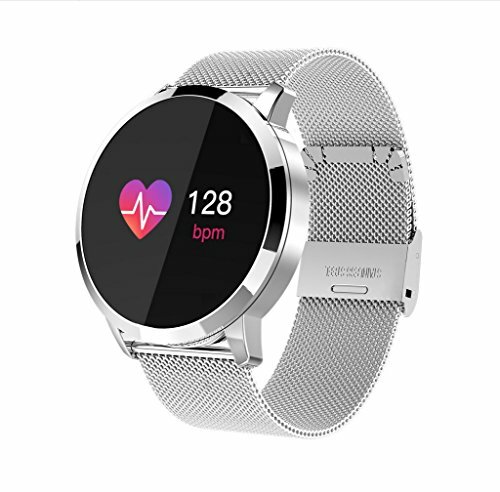 Its functions contain multiple-sport modes, GPS tracking, sleep monitor, pedometer, distance, calories, weather report, call & message notification, sedentary reminder, and so forth. The steps, heart rate and other activity data can be synchronized to Apple health APP or Google fit APP.such as NO DISTURBING MODE, REMOTE CAMERA CONTROL, FIND PHONE. ❥ HUMANIZED DESIGN AND COMFORTABLE MATERIAL. It's designed with a home button on 0.98 inches OLED full touch screen, USB wireless charging and IP67 grade waterproof. Metal buckle is designed for wearing more steadily. The wristband is made of high-quality TPU material that is softer and more durable. ❥ WIDER COMPATIBILITY. The fitness tracker works collaboratively with iOS 7.0 or above & Android 4.4 or above, such as iPhone 6/6s/6s plus/7/7 plus, Samsung Galaxy S6 edge+/S7/S7 Edge/S8/S8+/Note7/A8/A9/A9 Pro/J7, Sony Xperia Z5/Xperia XZ, Moto X Style/ G3 , and so forth. If you have any questions about this product by LJXAN, contact us by completing and submitting the form below. If you are looking for a specif part number, please include it with your message.